Why are two recently constructed high altitude ahu (shrines, altars) so threatening to the State of Hawai`i? Opening with this question, Greg Johnson’s lecture will explore the ongoing dispute over the Thirty Meter Telescope (TMT). 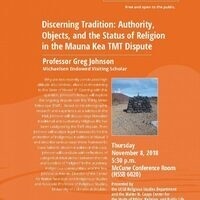 Based on his ethnographic research and his experience as a witness in the trial, Johnson will discuss ways Hawaiian traditional and customary religious life has been catalyzed by the TMT dispute. Then Johnson will analyze legal frameworks for the protection of indigenous traditions in Hawai`i and describe various ways these frameworks have failed to discern tradition in this case. Johnson will conclude with reflections of categorical mismatches between the role and function of “religion” in the academy, indigenous communities, and the law. Johnson is Interim Director of the Center for Native American and Indigenous Studies and Associate Professor of Religious Studies, University of Colorado at Boulder.